Construct and install a groundwater treatment system utilizing an innovative Carbon Dioxide (CO2) injection methodology to treat and lower the pH of caustic runoff water from a former Cement Kiln Dust storage area that had leached into the groundwater and subsequently into an adjacent creek (Sullivan Creek). Contaminated groundwater is funneled into a “treatment zone,” where the groundwater passes through a series of PVC lined baffles and comes in contact with 960 permeable tubes which inject CO2 into the groundwater, thus lowering the pH on contact. The treated groundwater is then released into Sullivan creek. 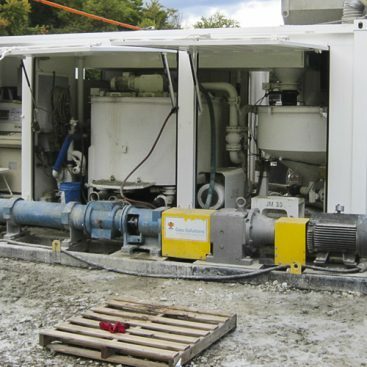 Project incorporated use of the following technologies: Shallow Soil Mixing, Cement-Bentonite-Soil Slurry Walls, Soil-Bentonite Slurry Walls, Bio-Polymer Slurry Walls and Wetlands Construction. Additionally, use of streambank stabilization measures, employing the use of gabion baskets and soil encasements. The treatment zone was constructed using an innovative Specialized Excavator Mixing method for Shallow Soil Mixing. The soils in the area contained cobbles and peat and were not suitable for auger mixing. Some of the unsuitable soils were discarded and select soils were imported from other areas of the site to supplement the soil mix wall construction. The walls were mixed in cells of 7-10 feet wide, 15-20 feet long to a depth of 15-18 feet below ground surface and a minimum of 2 feet into the underlying aquitard, which consisted of silty clay. A Hitachi 200 excavator with a thumb attachment was utilized for the excavation and mixing of the walls. A cement and bentonite slurry was pumped into the each cell during excavation and upon reaching the proper depth, the borrow soils were added into each cell and blended with the slurry, creating a homogenous mixture. Following a seven day curing cycle, the area inside the soil mixed retaining structure was excavated to facilitate construction of the treatment corridor. The exposed soil mixed walls were then lined with a 40 millimeter HDPE geomembrane and the walls and floor were next lined with 8 ounce non-woven geotextile. Forty-Eight (48) perforated HDPE pipes were placed in horizontal layers inside the treatment corridor in six rows of eight pipes per row with 1.5 feet of one and a half inch stone between layers. Each HDPE pipe contains 20 permeable tubes for dispersing CO2into the groundwater. The ends of the pipes are terminated in 16 polymer-crete vaults that contain the mechanical components of the CO2 injection system. Next, four baffles, consisting PVC liner attached to wooden frames, were placed spanning the width of the treatment zone at varying heights. Nine (9) six-inch and three (3) two-inch PVC monitoring wells were also placed inside the treatment zone. During the treatment process CO2 is pumped into the permeable tubes, and then “sparged” into the contaminated groundwater, lowering the pH of the groundwater before discharge into Sullivan Creek. The CO2 is created and stored in a tank in the building adjacent to the treatment zone. It is pressurized and carried to a series of manifolds contained in the polymer-crete vaults where it is distributed into the permeable tubes and diffused into the groundwater. Pressure gauges throughout the system are used to maintain a constant pressure in each of the multiple clusters of tubes. Pressure transmitters and solenoid valves in the primary manifold are connected to a Programmable Logic Control unit which controls the distribution of the CO2. A funnel and gate system was installed to channel the flow of the contaminated groundwater to the treatment corridor. 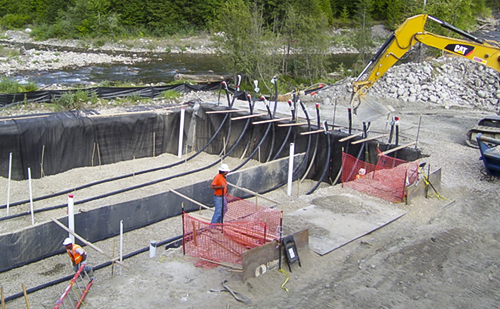 The funnel and gate system consisted of a French Drain installed by the bio-polymer slurry trenching method and a barrier wall installed by using the bentonite slurry trenching method. First, a French Drain was installed to the top of the aquitard using the Bio-Polymer trenching method at a depth that varied from 14-18 feet below ground surface. The French Drain was backfilled with a mixture of sand and minus three quarter inch gravel. Recirculation wells were placed at 20 foot intervals during placement of the backfill. Upon completion of the drain, the slurry was “broken” and the trench media was developed by circulating water throughout the trench via the wells. A soil-cement-bentonite slurry wall was installed down gradient from the French Drain to prevent water from by-passing the treatment zone. Since much of the spoils from the trench were unsuitable for backfill material Geo-Solutions used select, screened material from the site which was mixed with cement slurry and dry bentonite to prepare the low permeability slurry wall backfill. The project also included streambank restoration along the southern bank of Sullivan Creek with the installation of a gabion basket wall along Sullivan Creek to protect the treatment system and soil encasements to prevent erosion and to promote streambank vegetation and riprap erosion protection. 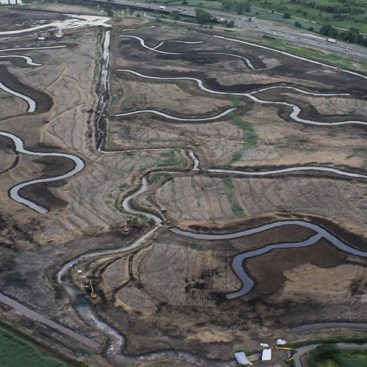 In addition, a small wetlands areas was created to replace the area that had been removed during site clearing and grubbing activities. After final grading was completed, over 1,300 shrubs were planted along the streambank and the site was returned to a natural looking state. 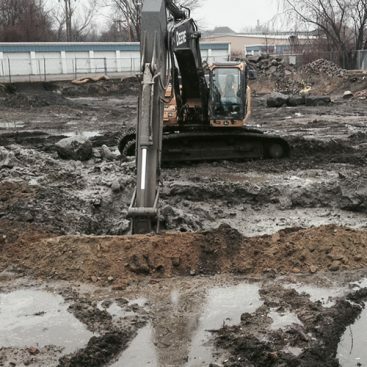 This project was the first time this remediation methodology had been employed. 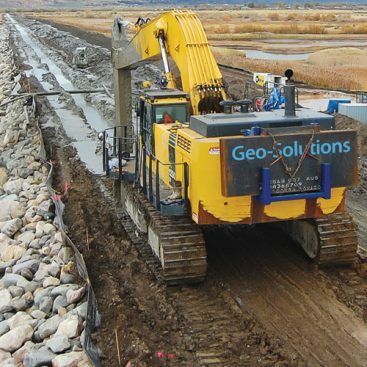 The presence of cobbles and unsuitable soils prevented the use of an auger for soil mixing and was replaced by Geo-Solutions’ Specialized Excavator Mixing methodology for Shallow Soil Mixing. Time constraints due to short daylight hours shortened the work days. Geo-Solutions proposed a Value Engineered alternative design to the client which saved the client more than $300,000 in costs by redesigning of the grading plan to balance cut and fill, thus saving 5,000 CY of borrow and replacing the sheet pile walls with a Soil Mixed retaining Wall. The treatment system operated as designed and was successful in lowering the pH of the groundwater to the desired pH level prior to discharge into Sullivan Creek. Project was completed on schedule with zero health and safety incidents.